Cheshunt ABC was founded by Charlie Bliss nearly 45 years ago in a green hut in Flamstead End, Cheshunt. The club was then later on down the line kicked out of its hut by Broxbourne Council and found refuge at Cheshunt Sports Club in Albury Ride, Cheshunt. Many champions have come out of the club during its time including a Junior Olympic Champion. 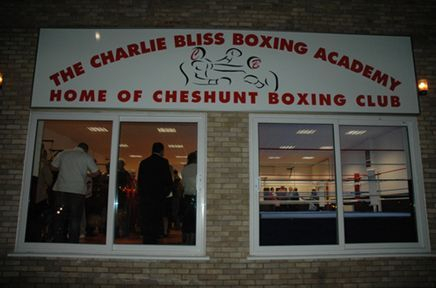 The club had it's brand new gym officially opened on March 3rd 2007, the Charlie Bliss Boxing Academy. The new gym was a life time dream of Charlie Bliss who sadly passed away a week before the official opening, though Charlie did get a chance to see the building very near to completion. The club is now be ran by Charlie's son Mark Bliss who has been the club's head coach now for many years. In 2015, we partnered with registered charity C-R-Y (Cardiac Risk in the Young) and screened 100 local young people in a bid to search for cardiac abnormalities, one of the leading causes of sudden death in the UK. During this time, and thanks to the help of the Broxbourne Council and rigid fundraising efforts, we were able to identify 6 people with cardiac abnormalities, of whom received further tests, including one who was referred to a specialist in London. This would have gone undetected if it wasn't for our cardiac screening. Cheshunt Boxing Club have been apart of the highly renounced Box Cleva scheme since pilot trials began in 2010. During this time, we have opened our doors to hundreds of different children aged 7-15, with whom we teach the importance of Healthy Eating, discipline and respect as well as Drugs Awareness sessions on a weekly basis. Our coaches also partake in this scheme - a scheme which was awarded the Queens Award for Voluntary Service (QAVS) and has earned the right to use the Queen's Crest on its logo - in other regions of Hertfordshire. Everyone involved with the club do there best to continue the hard work and dedication Charlie Bliss gave to make it one of the best Amateur Boxing Clubs in the United Kingdom. To get involved in the continuously developing Cheshunt Boxing Club story, feel free to pop down and visit us at any time. Our opening hours can be found by clicking here.